(a) A place where animals are protected in their natural habitat is called ______. (b) Species found only in a particular area is known as _______ . (c) Migratory birds fly to far away places because of _______ changes. (a) A place where animals are protected in their natural habitat is called sanctuary. (b) Species found only in a particular area is known as endemic. (c) Migratory birds fly to far away places because of climatic changes. 1) An area protected for animals where animals can live in their natural habitat is known as a wildlife sanctuary An area which is conserved to protect the biodiversity and culture of that area is known as biosphere reserve. 2) There are about 514 wildlife sanctuaries in India There are 18 Biosphere reserves in India. 3) In these sanctuaries hunting, poaching, grazing, felling trees etc. are strictly prohibited A biosphere reserve consist of many protected areas like sanctuaries, national parks, lakes mountains etc. 1) Animals are kept in artificially constructed facilities for public exhibition. A large area within which wild animals are protected and conserved . The areas are prohibited for hunting, grazing, felling trees etc. It is a place where animals live in artificial habitat. It is a place where animals live in natural habitat. 1) The species which are at the verge of extinction and which are required to be protected and conserved are known as endangered species. The species which no more exist on the earth are known as extinct species. 1) The plants that grow naturally in a particular area are called flora of that area. The animals which live naturally in a particular area are called fauna of that area. Deforestation is the removal of trees or other vegetation from an area for industrial, agricultural or other purposes. Forests are the natural habitats of many animals, birds and plants.When forest trees are cut down, the natural habitat of wild animals and birds gets destroyed.In the absence of forest trees and plants and animals, wild animals and birds do not get enough food and starve to death. Trees use carbon dioxide gas from the atmosphere for the process of food making called photosynthesis.When a lot of trees are cut down during deforestation, then lesser number of trees will be left.The lesser number of trees will use up less carbon dioxide due to which the amount of carbon dioxide in atmosphere will increase.Carbon dioxide gas trap the sun heat rays reflected by the earth.Trapping of heat rays by carbon dioxide increases the temperature of earth’s atmosphere.This will lead to global warming.The global warming melt polar ice caps rapidly producing a tremendous amount of water leading to a rise in the sea level.The raised sea-water level will flood the low-lying coastal areas causing huge loss of life and property. When the forests are cut down during deforestation, there are no roots of trees which can bind the soil particle together and prevent them from being carried away by strong winds or flowing rain water.The top soil of earth is most fertile.The removal of top layer of soil during soil erosion, exposes the lower, hard and rocky layer os soil.This lower layer of soil has less humus and is less fertile.Plants do not grow well in this less fertile soil.Hence , a fertile land which is a source of living for farmers in village, gets converted into desert. Cities are not directly affected by deforestation.But deforestation can increase the risk of many natural calamities such as floods, droughts etc in that area.Deforestation can also increase the level of carbon dioxide in atmosphere which can leads to global warming. Deforestation has affected our climate very much. Many species are at the verge of extinction because of deforestation and some species are already extinct. The next generation may not be able to see many beautiful and attractive fauna and flora. Deforestation is responsible for global warming, desertification, floods, droughts, soil erosion, green house effect etc .As a result the next generation has to face many problems due to it. 4. What will happen if. If we go on cutting the trees, the animals will lose their natural habitat as the trees, an essential part of their ecosystem are destroyed. This reduces the biodiversity of the affected areas. The temperature of the Earth also increases and gives way to global warming. Global warming, in turn, affects the water cycle. Hence, rainfall pattern changes leading to droughts and floods. Risks of soil erosion, global warming, desertification, greenhouse effect increases. Forests are the natural habitats of many animals, birds and plants.When forest trees are cut down, the natural habitat of wild animals and birds gets destroyed.In the absence of forest trees and plants and animals, wild animals and birds do not get enough food and starve to death. When the forests are cut down during deforestation, there are no roots of trees which can bind the soil particle together and prevent them from being carried away by strong winds or flowing rain water.Since there is no tree cover on the soil to soften the effect of heavy rain, the bare top soil becomes loose quickly by the force of falling rain water and erode rapidly.The top soil of earth is most fertile.The removal of top layer of soil during soil erosion, exposes the lower, hard and rocky layer os soil.This lower layer of soil has less humus and is less fertile.Plants do not grow well in this less fertile soil.The fertile land gets converted into a desert.The process by which fertile land becomes desert is called desertification. Biodiversity means biological variety.It refers to the variety of organism(plants, animals and micro-organism) found in a particular area or habitat.The conservation of plants and animals means that plants and animals which occur in the forests should be kept in a way that they remain protected in the natural environment in which they are found.Both plants and animals have a mutual dependence on each other for their survival. As they are related to one another, destruction of one will automatically destroy the other. Hence, the biodiversity has to be conserved in order to maintain the nature’s balance. People who live near the forests depend on the resources of the forests in order to fulfill their day-to-day needs. Therefore, it is not safe for the animals living in the protected forests. The animals would be threatened by the presence of the human population. This results in the killing of wild animals and selling their products for huge sums of money. The forests provide food, shelter, fuel , wood and other resources to the tribal people. They depend on forests and its resources for everyday needs. 1) They are cut down to obtain wood for using fuel. 2)They are cut down to obtain wood for making doors, windows and furniture. 3)The forest trees are cut down to obtain wood for making paper. 4)The forest trees are cut down to obtain more agricultural land for cultivation of crops for the increasing population. 5)The forest trees are cut down to get land for building houses,factories,roads and dams. 6) Forest fire can burn down all the trees and other vegetation of the forest. 7) When severe drought occur, the forest trees dies out because of lack of water. 2) It will cause an increase in temperature of earth’s atmosphere leading to global warming. 3) It will cause soil erosion making soil infertile and lead to desertification. 4) It will cause frequent flooding of rivers leading to loss of life and property. 5) It affects the water cycle leading to decrease in rainfall.The decrease in rainfall lowers the groundwater level and could cause droughts. 6)It leads to extinction of many wild animals and plants. Red Data Book is the book which keeps a record of all endangered animals, plants and species.It contains a list of species which are in danger of becoming extinct. Some of the endangered species of animals listed in Red Data Book are Flying squirrel,Indian giant squirrel, Black buck, Himalayan musk deer, Great Indian rhinoceros, Snow leopard, Tiger etc. The process of a bird moving from one place to another according to the season, is called migration. Migration of bird is an adaptation to escape the harsh and cold conditions of their normal habitat in winter so as to survive.When the winters sets in cold regions of the earth, the climate becomes extremely cold in these regions.The birds which normally live in these regions, migrate to far flung warmer places on earth to escape the extremely cold winter climate and survive.And when the winter season is over, these birds fly back to their habitats in cold regions. trees are being continually cut. Is it justified to cut trees for such projects? Discuss and prepare a brief report. No, it is not at all justified to cut trees in order to meet the ever increasing demand in factories and for shelters.When the forest trees are cut down, the percolation of rain water into soil is reduced.A lot of rain water from deforested soil rushes into the rivers quickly, causing floods.Deforestation decreases the water holding capacity of soil which leads to floods.Forests are the natural habitats of many animals, birds and plants.When forest trees are cut down, the natural habitat of wild animals and birds gets destroyed.In the absence of forest trees and plants and animals, wild animals and birds do not get enough food and starve to death. Cutting of trees affects the water cycle leading to decrease in rainfall.The decrease in rainfall lowers the groundwater level and could cause droughts. Cutting of trees causes soil erosion making soil infertile and lead to desertification. 7. How can you contribute to the maintenance of green wealth of your locality? Make a list of actions to be taken by you. 1) I can grow more and more plants in the locality. 2) The resident should work together to conserve the green belt of the locality.They should be taught about the consequences of deforestation and global warming. 3) I shall motivate the people of my neighbourhood to plant more trees and take care of the existing trees by creating an awareness about the importance of the plant life in an ecosystem. 4) I can make young children aware of the effect that deforestation has on our environment. The forest trees put a lot of groundwater, sucked through their roots, into the atmosphere as water vapour by the process of transpiration.This water vapour helps in bringing rain in that area.When the forest trees are cut, then the lesser number of trees put less water vapour into atmosphere through trough transpiration.Since less water vapour is put into the atmosphere, there is less rainfall in that area.When there is less rainfall in an area, then less water percolates into the ground.Due to this, groundwater level also gets lowered.The shortage of surface water and groundwater due to persistent low rainfall in an area can lead to droughts. on the outline map of India. Do yourself according to your state. 1) We should recycle the waste paper. 2) Paper should be sent through proper channel for recycling. 3) We should not tear our old books and donate it to poor children so that they can reuse those books. We should encourage buying recycled paper products. 4) We should avoid taking paper bags from the shops, instead we should carry jute bags. 5) Use both sides of paper for writing. 6) Spread awareness about paper about the importance of paper among the school children and youth. 11. 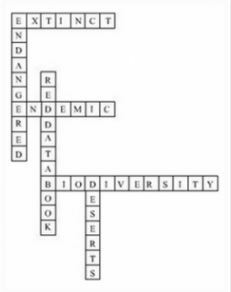 Complete the word puzzle.